Mixology today is a crafty game of one-upmanship. Behind the bar is a mad scientist’s workshop as bartenders borrow freely from many disciplines. Some far-out techniques offer practical, operational advantages, says Dave Thor Newman, owner of the Pint + Jigger, an upscale casual restaurant in Honolulu. One trick is barrel aging spirits, a top on-premise trend, according to Technomic’s 2014 Drink Trends in Focus report. It’s popular but slow. Newman found a quicker way to infuse spirits with that barrel-aged taste. He uses an immersion circulator—a tool that chefs have popularized for sous-vide cooking in which foods are packed into bags and very slowly cooked under vacuum to a tender turn. Cocktails crafted from these spirits are the result of a moment of inspiration and weeks of experimentation. “Some friends and I were drinking whiskey and geeking about the differences between scotch and bourbon,” says Newman. American whiskey, he explains, requires fewer years in oak barrels to mature than does malt Scotch; four or five versus 10 to 12. The determining factor, Newman and his friends decided, was the hot Kentucky summers, driving up temperatures in the rickhouses where whiskey sleeps in barrels. Experimenting both at home and in a restaurant where he was working, he first tried introducing heat directly to barrels filled with spirits to get that aged flavor, with negligible results. Then he commandeered a restaurant kitchen’s immersion circulator, gently heating spirits and barrel chips in a sous-vide bag at a low, controlled temperature for 18 to 48 hours. The liquor rapidly extracted desirable flavor compounds from the oak and gained a touch of sweetness and silky texture. “I tasted the results, and it blew me away. The liquor was amazing,”says Newman. Next, he tried aging cocktails under vacuum. Although the sous-vide technique won’t totally replace traditional barrel aging, says Newman, it saves money and time. Even small barrels designed for bar use require five-gallon batches, which translates to $1,000 worth of product. If the cocktail doesn’t age well, that money goes down the drain. And, if the bar runs out of a popular aged cocktail, it can take half a year to replenish since most bars spring for only one barrel. 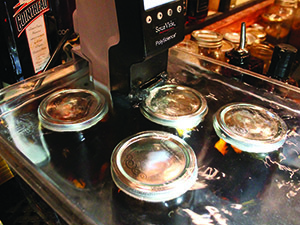 With the sous-vide method, Newman works with small batches using jars and results take just two days. Currently on Pint + Jigger’s cocktail list is the Sous Vide Brown Trout ($12): a mixture of gin, Scotch, Aperol and gentian and elderflower liqueurs. The bar also has featured sous vide-aged Vieux Carre and a Dark & Stormy. Because the latter uses pungent fresh ginger in the mix, it can be finished with soda water instead of the traditional ginger beer; an operational plus and cost savings. Newman invested in a quality immersion circulator (costing about $1,200) because he wanted to install it on Pint + Jigger’s backbar to show it off. That prominent position excites customers—and generates drink orders. “It’s a conversation piece,” he says. Sous vide drinks are priced a dollar or two higher than other cocktails to offset the modest costs. However, the real payback is the bar’s reputation for innovation.